Thomas Sabo welcomes the Chinese New Year 2017 with various charm creations based on the watchful sun bird. 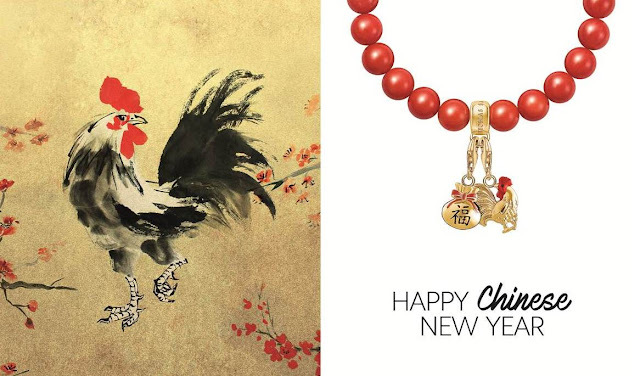 The Year of the Rooster 2017 stands for a new beginning and epitomizes loyalty and intelligence as well as attractiveness, artistic patterns and colour combinations with auspicious red allow the beautifully detailed jewellery items to shine. In addition to the rooster design, the little money bag decorated with Chinese characters and a red ribbon also promises an extra portion of luck for 2017. The lucky charms look particularly beautiful on the delicate Charm Club bracelets with pearls of red coral.